The more I counsel an individual, the more I see the stress from loss and traumas leave their face. I have always said grief is mental, emotional, physical and spiritual. I cannot see the spiritual components on the outside of someone, but the other three aspects are shown on their face. The experiences of mental agony, distressing feelings and increased physical pain or stress are often visible on a person’s face; sometimes for years. 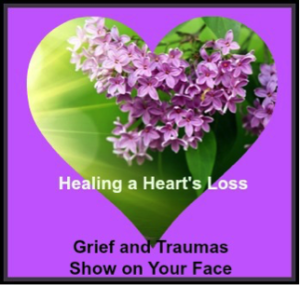 Often the first time I meet a person is when they are experiencing trauma and grief losses. Over time I begin to see a smile and softness start to appear in their face. Of particular interest to me are a person’s eyes. I truly believe the saying; “the eyes are a window into the soul”. When stress and grief are present in an individual’s life their eyes seem to be dark and empty. There can be a faraway gaze that looks nowhere; do you know what I mean? Comments such as; “I do not cry”, “I cannot remember the last time I smiled”, I don’t feel anything anymore” and “I just don’t want to be here (in this life) and experience this pain and grief any longer, I’m done!” are expressed often with grief. The verbalizations of these feelings are part of the releasing. The release of grief for whatever reason and in whatever manner, over time has a way of opening a door a little and letting the light or brightness shine on an individual. The softening of the face starts with a smile and a soft remembering. This is when the eyes start to sparkle and shine. You know there is more inside that person than darkness and grief. The tense, furrowed lines become rounded curves where the colour in their cheeks becomes pink. The grey tint to their skin disappears. For one individual it might be the first time they looked at the pictures of their deceased child and see the funny moments instead of the death. For another individual it might be opening the curtains and seeing daylight or feeling the warmth of the sun. I want to add a note here that not everyone is able to release their grief and may be stuck in it. The effects of stress, grief and traumas in life can and do hold many people hostage. Some people need help opening the door of their hearts and letting the softness return to their face; to smile and see the sparkle in their own eyes.